Compatible with Apple Smart cover, SGP Skin Guards,and Incredible Shield. – Just add a comment to this post and you’re in with a chance to win. – For an extra entry and a better chance of winning, take a look at the review mentioned above and tell us what you like best about the case. That’s it. On Friday we’ll draw one lucky winner and get the case shipped off to them soon afterwards. The microfiber chamude rocks, and the magnetic encloser for easy on and off… Awsome case sounds like ! Cool looking case to show off at my day hospice. I’ve never owned any Chamude before, this would be great! That will be great for my ipad, hope you can send it to Uk. Many congrats for your work! Just looking at it makes me fall in love, what mo to be said? 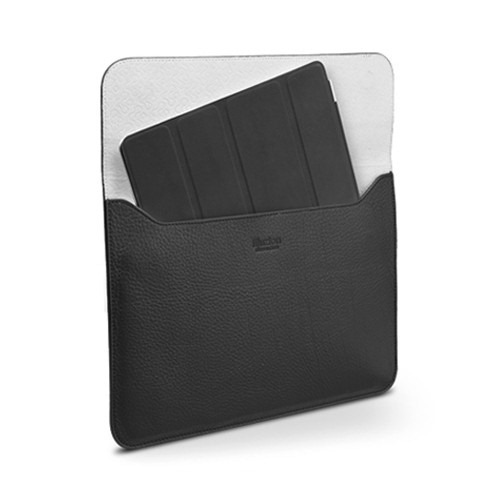 The SGP illuzion Leather Sleeve Case for the New iPad’s compatibility with existing iPad accessories (Smart Cover) makes it truly a part of the Apple family: ease of use, ease of adaptation. In addition to the supple leather exterior, I like that I will be able to carry my iPad without having to remove the Apple Smart Cover. I would really enjoy this handsome case! I have been considering buying one of these. Great review, useful info. The sleeve case looks really slick. Would love to have it. I love this beautiful case. I love the look of the leather and the fact that it houses it with the smart cover. I love the leather and smart-looking! Looks like a leather Manila folder,perfect!